We completed the desk area first and used a smaller travertine tile here. After we had it all up I decided that the smaller would be too busy everywhere in the kitchen so we headed back to the tile store to return the smaller and to buy the larger ones. The larger tiles went up much faster and they still tie into the desk area because they are the same color story. We had a few tiles that kept wanting pop off the wall for some reason so I just tapped them up till they dried. Worked like a charm. This is The Hubster just before we started on the last area to be tiled. He looks so thrilled does't he! ;) He was a really good sport and he loves the end result. 11:30 Saturday night putting up the last tile. Probably one of the worst pics ever but hey just keeping it real after three non stop days of working. We both are in love with how it all turned out! Sunday I took the day off but now I am now busy sealing and grouting everything. I am still torn on paint color for the walls even though I already purchased two gallons. I am also still torn on the cabinet color. I am pretty sure it will be Old White though. The Papa is trying his hardest to get me not to paint the cabinets. 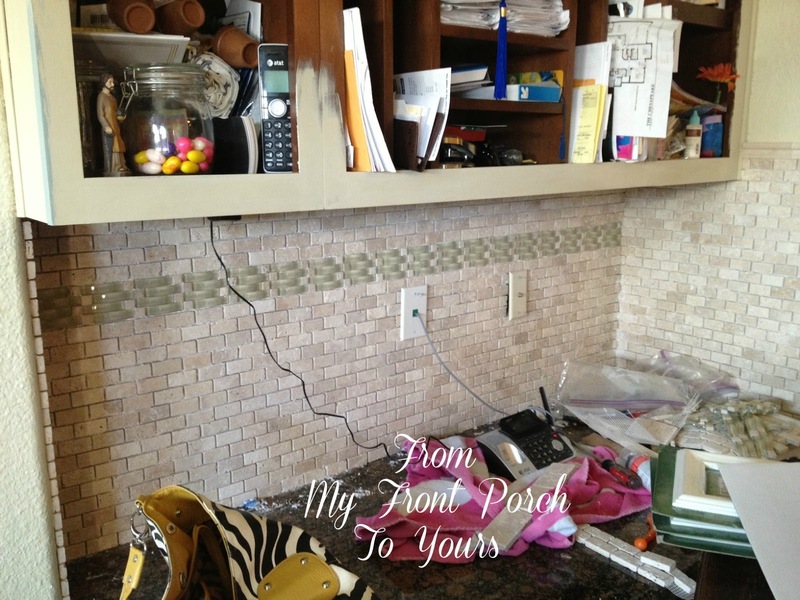 I just "have" to though to achieve my vision of a brighter kitchen and trust me the cabinets may look nice from afar but they are dinged and scratched in some places and hazy for some reason in others. 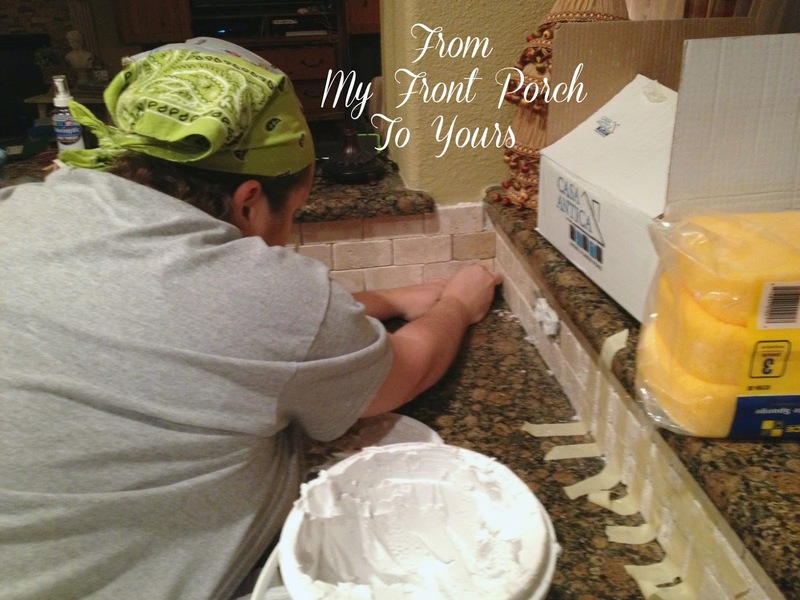 Our plans do not stop at tiling and painting! We had to take our monster of a micro down from above the stove because the builder had tiled behind it. Once it came down The Hubster kept eyeing it and I knew exactly what he was thinking. The micro was not to go back up! It was something I have been dreaming to do for awhile now so it thrilled me to pieces that he saw the vision too. Now we are in the process of designing a custom hood. A lot of my inspiration pics have hoods with display shelves so I knew I had to have one. I can not wait to actually start building it! See ya back here tomorrow for the most viewed links from last weeks Treasure Hunt Thursday! I will also share a treasure I found over the weekend for the kitchen! I just love it when things come together! Very impressive! 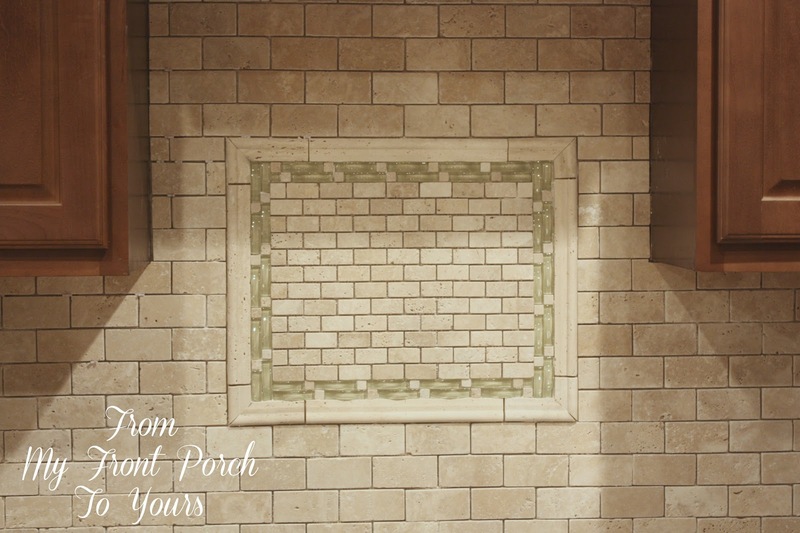 I love the tile you chose and can't wait to see more! I think I have the same kitchen floor as you! 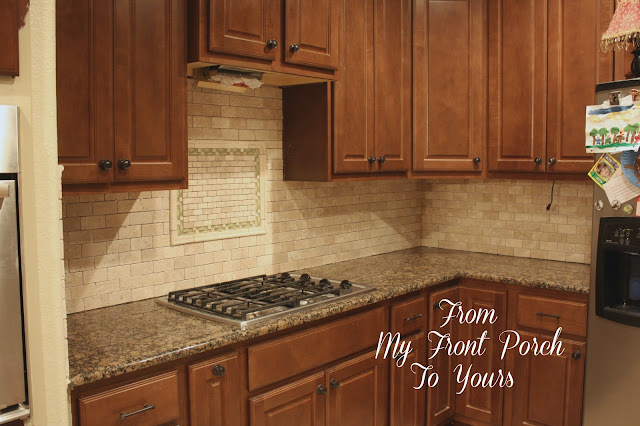 You're going to love your kitchen when it is finished! And your wallet will definitely love the elbow grease you are putting in, instead of hiring everything out! I love your new tile! The touch of green (khaki) is so pretty, and how exciting to be designing a custom hood. 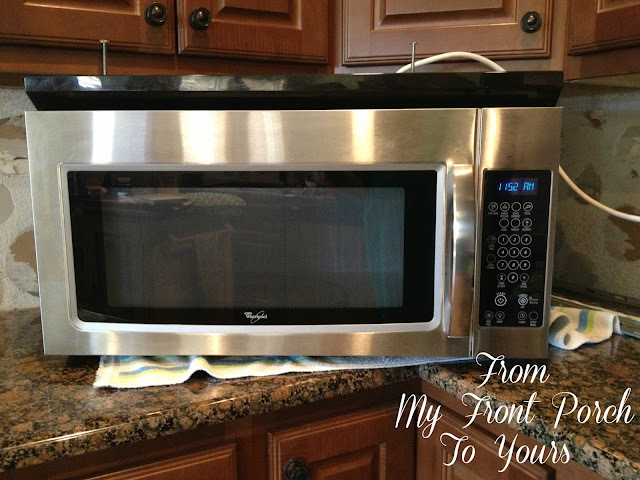 Your kitchen is going to be fabulous because you have such good taste! It looks fabulous! Can't wait to see it all done! So jealous about the range hood! How exciting!!! Great job!!! Wow, you guys are hard workers! The tile looks gorgeous! Great job! Wow Pamela your kitchen looks amazing already! You both did a beautiful job on your back splash!You both should be proud of the work you did! 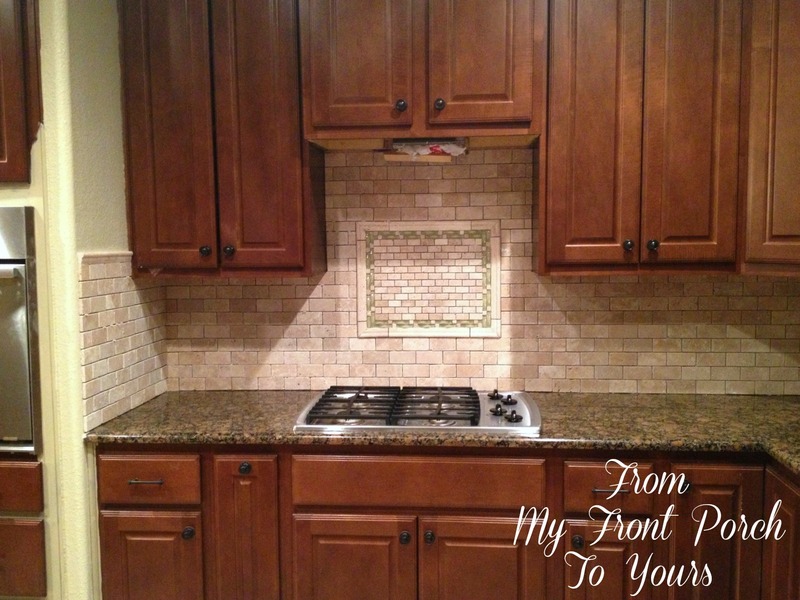 Wow, Pamela, fabulous job on the backsplash. Truly gorgeous. Girl you guys did an AMAZING job!! Love the tile, it looks beautiful! 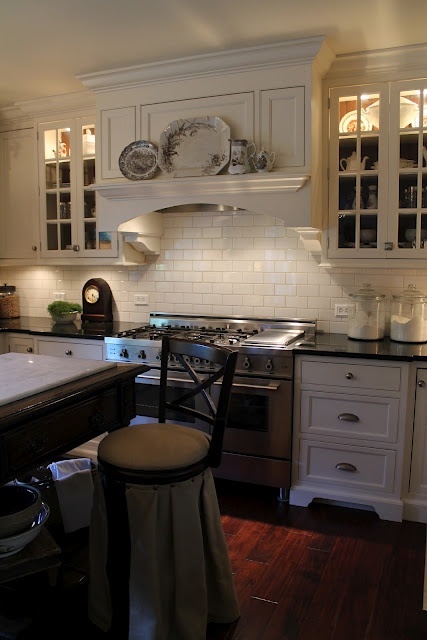 Pam, The tile looks wonderful and I love the idea of a hood. It's looking great Pamela! I love the little touch of green :) glass tiles. Your inspiration pics are gorgeous! We have a mantle above our stove and I love it! One of my favorite parts of the kitchen. You find the best inspiration photos! I love all the ones you post on FB. Look's Fabulous. I love it you chose the smaller version to the same tile I bought. Very beautiful Job. You guys should be very proud. 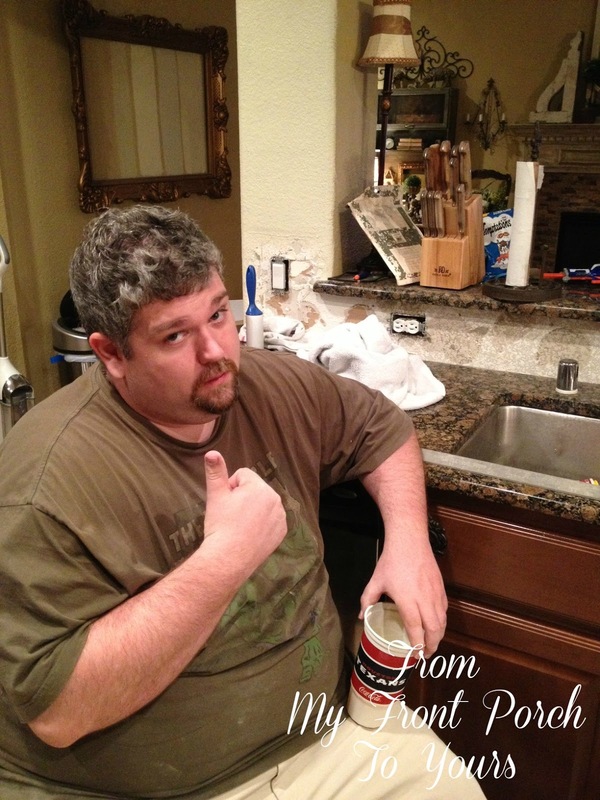 Your kitchen is looking great..can't wait to see the new stove hood. Oh...Savannah is a doll! There's something special about doing the kind of work with your husband (if one doesn't kill the other!). You guys are hard workers, and it paid off. The outcome is stunning! I bet you are so excited. The tile looks awesome. Can't to see the full reveal! It looks beautiful..What an awesome job you both did..Can't wait to see the rest done..Have a great week..
Love the wall. The tiles are just beautiful. What a great job. Gorgeous ! Can't wait to see the cabinets painted and the new hood ! great job you guys!! it looks fabulous! Love your new tile! It's going to be amazing! It's looking SO good....PAINT THE CABINETS....don't be swayed!! He'll LOVE it when it's done! When we were building our house most people tried to talk me out of my simple white beadboard cabinets(especially the cabinet guy...he just couldn't understand why I would want such "plain" cabinets), but I stuck to my vision and all the magazine photos I'd collected...since there wasn't Pinterest back then. I've never, in ten years, regretted them and I still love my kitchen! Gorgeous job, I love it. I want to do something like your back splash in when we get to that point. Savanah is adorable. It is good to see her I often think about her sine I am the one with two doxie pups. Pamela it looks absolutely gorgeous. I love the tile choice! Totally worth the effort in the long run. I really love your idea for the bars stools, like putting a dress on stool and making it that much fancier! 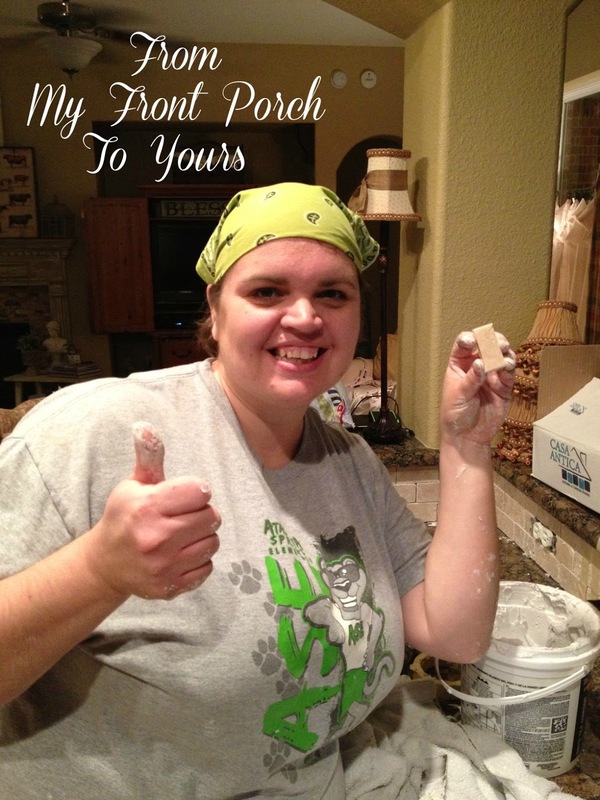 Pamela...blogher is featuring this post today. I had to stop back over because I am wondering what you are going to paint your cabinets. Stark white? Cream? 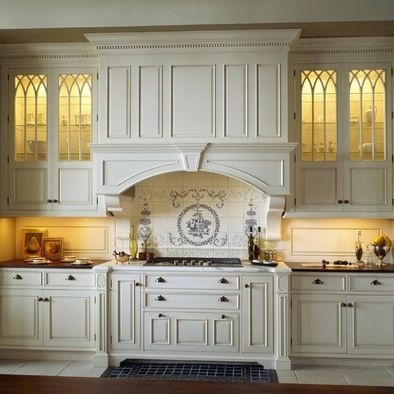 I love light kitchens and I wish I could paint the kitchen I am in now. Beautiful job! I love your white cabinets - perfection. 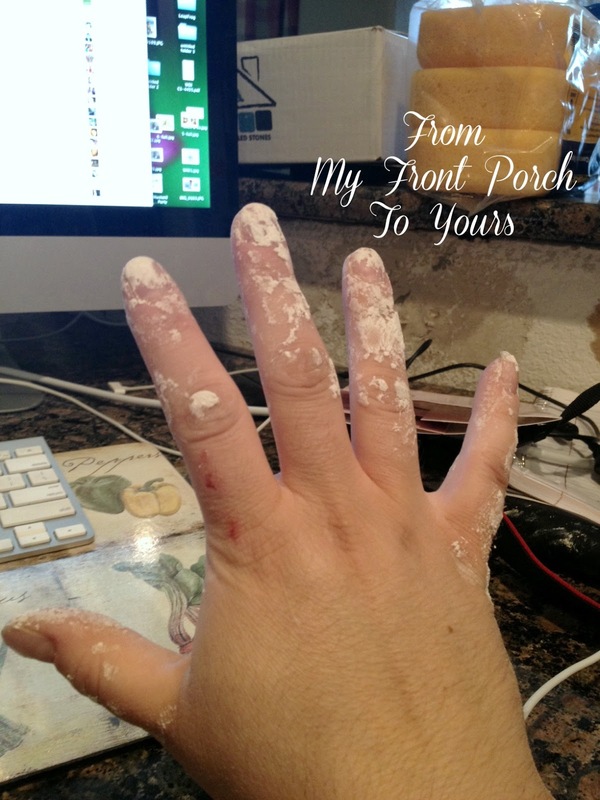 : ) I, too, am painting my kitchen cabinets creamy white. I am in the sanding/priming phase; not using AS paint. I am so excited to see the end result. 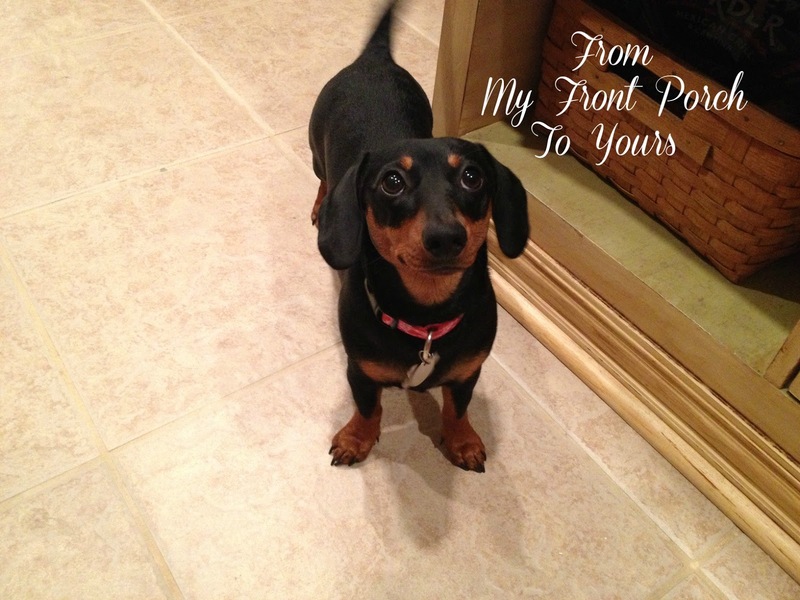 Your doxie, Savannah, is adorable. I have one very much like her named Emma. She is my heart and the sweetest little dog in the world. I can tell your little girl is, too. Looking forward to seeing more projects in the future!